Robert Norman Ross (October 29, 1942 – July 4, 1995) was an American painter, art instructor, and television host. He was the creator and host of The Joy of Painting, an instructional television program that aired from 1983 to 1994 on PBS in the United States, and also aired in Canada, Latin America, and Europe. Ross went from being a public television personality in the 1980s and 1990s to being an Internet celebrity in the 21st century, becoming popular with fans on YouTube and many other websites after his death. For other people named Bob Ross, see Bob Ross (disambiguation). In 1961, 18-year-old Ross enlisted in the United States Air Force and was put into service as a medical records technician. :15 He eventually rose to the rank of master sergeant and served as the first sergeant of the U.S. Air Force Clinic at Eielson Air Force Base in Alaska, where he first saw the snow and mountains that later became recurring themes in his artwork. He developed his quick-painting technique to create art for sale during brief daily work breaks. Having held military positions that required him to be, in his own words, "tough" and "mean", "the guy who makes you scrub the latrine, the guy who makes you make your bed, the guy who screams at you for being late to work", Ross decided that if he ever left the military, he would never yell or raise his voice again. During his 20-year tenure with the U.S. Air Force, Ross developed a taste for painting after attending an art class at the Anchorage U.S.O. club. He found himself frequently at odds with many of his painting instructors, who were more interested in abstract painting. In Ross' own words: "They'd tell you what makes a tree, but they wouldn't tell you how to paint a tree." Ross was working as a part-time bartender when he discovered a TV show called The Magic of Oil Painting, hosted by German painter Bill Alexander. :17–18 Alexander touted a 16th-century style of painting called "alla prima" (Italian for "first attempt"), better known as "wet-on-wet", that allowed him to finish a painting in a little under 30 minutes. Ross studied and became quite good at alla prima through Alexander's show, and began selling Alaskan landscapes painted on the inside of novelty gold pans. When Ross began making more money from selling the gold pans than his military job, he retired from the Air Force in 1981 after 20 years of service, having the rank of Master Sergeant. The origins of the TV show, The Joy of Painting, are unclear. It was filmed at the studio of the PBS station WIPB in Muncie, Indiana. The show ran from January 11, 1983 to May 17, 1994, but reruns still[update] continue to appear in many broadcast areas and countries, including the non-commercial digital subchannel network Create. During each half-hour segment, Ross would instruct viewers in oil painting using a quick-study technique from the imagination that used a limited palette of paints and broke down the process into simple steps. Art critic Mira Schor compared him to Fred Rogers, host of Mister Rogers' Neighborhood, noting that Ross' soft voice and the slow pace of his speech were similar. With help from Annette Kowalski, Ross built a $15 million business, Bob Ross Inc., selling his line of art supplies and how-to books, and marketing painting classes taught by instructors trained in the "Bob Ross method". All of his income, he said, was derived from those sources; the show was intended to be a vehicle to promote his classes and products. All of his paintings, including those created during his shows, were donated to PBS stations. Ross also filmed wildlife, squirrels in particular, usually in his garden, and he would often take in injured or abandoned squirrels and other animals. Small animals often appeared on his Joy of Painting canvasses. Ross used the wet-on-wet oil painting technique, in which the painter continues adding paint on top of still-wet paint rather than waiting a lengthy amount of time to allow each layer of paint to dry. From the beginning, the program kept the selection of tools and colors simple so that viewers would not have to make large investments in expensive equipment. Ross frequently recommended odorless paint thinner (aka odorless mineral spirits) for brush cleaning. Combining the wet painting method with the use of large one- and two-inch brushes, as well as painting knives, allowed Ross to paint trees, clouds, mountains, and water in a matter of seconds. Each painting would start with simple strokes that appeared as nothing more than smudges of color. As he added more and more strokes, the blotches would transform into intricate landscapes. Ross painted three versions of almost every painting featured on his show. The first was painted prior to taping, and sat on an easel, off-camera, during filming, where Ross used it as a reference to create the second copy—the one viewers actually watched him paint. After filming the episode, Ross painted a third, more detailed version for inclusion in his instructional books. Ross dedicated the first episode of the second season of The Joy of Painting to Bill Alexander, explaining that "years ago, Bill taught me this fantastic [wet-on-wet] technique, and I feel as though he gave me a precious gift, and I'd like to share that gift with you [the viewer]". As Ross's popularity grew, his relationship with Alexander became increasingly strained. "He betrayed me," Alexander told the New York Times in 1991. "I invented 'wet on wet', I trained him, and ... he thinks he can do it better." Art historians have pointed out that the "wet-on-wet" (or alla prima) technique actually originated in Flanders during the 15th century, and was used by Frans Hals, Diego Velázquez, Caravaggio, Paul Cezanne, John Singer Sargent, and Claude Monet, among many others. 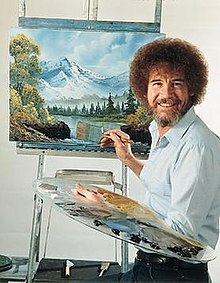 Ross was well known for the catchphrases he used while painting such as "happy little trees". In most episodes of The Joy of Painting, Ross would note that one of his favorite parts of painting was cleaning the brush. Specifically, he was fond of his method of drying off a brush that he had dipped in odorless thinner by striking it against the thinner can (then striking a box for early seasons, and trashcan for later seasons; occasionally he would strike the brush hard on the trashcan, and say he "hit the bucket") and easel. He would smile and often laugh aloud as he said to "beat the Devil out of it". He also used a palette that had been lightly sanded down, which was necessary to avoid catching the reflections of the strong studio lighting. Ross wore clothes that he believed would be a "timeless look" (jeans and a button-down shirt). He also used a minimalist set and spoke as if he were only addressing one viewer. I got a letter from somebody here a while back, and they said, "Bob, everything in your world seems to be happy." That's for sure. That's why I paint. It's because I can create the kind of world that I want, and I can make this world as happy as I want it. Shoot, if you want bad stuff, watch the news. The landscapes he painted—typically mountains, lakes, snow, and log cabin scenes—were strongly influenced by his years living in Alaska, where he was stationed for the majority of his Air Force career. He repeatedly stated on the show his belief that everyone had inherent artistic talent and could become an accomplished artist given time, practice, and encouragement, and to this end was often fond of saying, "We don't make mistakes; we just have happy accidents." In 2014, the blog FiveThirtyEight conducted a statistical analysis of the 381 episodes in which Ross painted live, concluding that 91 percent of Ross' paintings contained at least one tree, 44 percent included clouds, 39 percent included mountains and 34 percent included mountain lakes. By his own estimation, Ross completed more than 30,000 paintings in his lifetime. Ross was fond of country music, and in 1987 he was invited on stage by Hank Snow at the Grand Ole Opry in Nashville, Tennessee. The audience gave him a huge ovation; he was slightly nervous at first, but felt better after cracking a joke to the crowd. Snow was later given a private painting lesson by Ross. Ross visited New York City to promote his hardcover book, The Best of the Joy of Painting with Bob Ross, and painting techniques to a studio audience several times. One visit in 1989 he appeared on The Joan Rivers Show. He returned in 1992 for a live show with hosts Regis Philbin and Kathie Lee Gifford. There was one in 1994, when Phil Donahue, who watched his videos and loved his painting technique, invited him to the show to promote his work. Ross took five audience members on-stage to do a painting and even Phil himself did a painting and showed it in that episode. In the early 1990s, Ross did several MTV promotional spots that, according to the American City Business Journals, "dovetailed perfectly with Generation X's burgeoning obsession with all things ironic and retro." Ross had one son, Steven Ross, with his first wife, Vivian Ridge. Steven, also a talented painter, occasionally appeared on The Joy of Painting and became a Ross-certified instructor. Steven appeared on camera in the last episode of Season 1, in which he read a series of general "how-to" questions sent in by viewers during the season, and Bob answered them one at a time, technique by technique, until he had completed an entire painting. Ross and Ridge's marriage ended in divorce in 1977. Ross and his second wife, Jane, had no children together. In 1992, Jane died of cancer. In 1995, two months before his death, Ross married for a third time to Lynda Brown. Ross is known to have been very secretive about his life and had a great liking for privacy, with only a tight circle of friends. Some of only a few interviews with his close-knit circle of friends and his family can be found in the 2011 PBS documentary Bob Ross: The Happy Painter. His company, Bob Ross Inc., is protective of his intellectual property and his privacy to this day. Ross was diagnosed with lymphoma in the spring of 1994, which eventually forced him to retire; the final episode of The Joy of Painting aired on May 17, 1994. He died at the age of 52 on July 4, 1995. His remains are interred at Woodlawn Memorial Park in Gotha, Florida, under a plaque marked: "Bob Ross; Television Artist". Ross kept his diagnosis a secret from the general public, and his lymphoma was not known outside of his circle of family and friends until after his death. Since his death, Ross has been embedded in multiple instances of pop culture. Commenting for a 2017 news story about him, entertainment website Screen Rant would note that the artist "continues to have one of the most remarkable second lives of any media figure of the past several decades"  References to him have been included in television shows including Family Guy, The Boondocks, and Peep Show. and Wreck it Ralph. His videos became popular with devotees of the autonomous sensory meridian response (ASMR). Google celebrated the 70th anniversary of his birth with a Google Doodle on October 29, 2012. It portrayed Ross painting a depiction of the letter "g" with a landscape in the background. In 2015, Bob Ross was included in a commercial for HGTV Sherwin-Williams paint along with Leonardo da Vinci, Andy Warhol, Michelangelo and Vincent van Gogh. As part of the launch of Twitch Creative, Twitch.tv hosted a nine-day marathon of Bob Ross' The Joy of Painting series which started on October 29, 2015 in commemoration of what would have been his 73rd birthday. Twitch reported that 5.6 million viewers watched the marathon, and due to its popularity, created a weekly rebroadcast with one season of The Joy of Painting to air on Twitch each Monday, and will have a marathon of episodes each October 29. A portion of the advertising revenue has been promised to charities, including St. Jude Children's Research Hospital. In June 2016, Ross' series Beauty Is Everywhere was added to the Netflix lineup. The 30-minute episodes are taken from seasons 20, 21 and 22 of the original The Joy of Painting series. In May 2017, Ross' likeness was added as a skin for Sylvanus in the MOBA video game Smite Of the inclusion, website Venturebeat would go on to call it,"one of the most bizarre crossovers in gaming history,"  At one point Ross was going to have his own video game to be released on Wii, the Nintendo DS and PC with development handled by AGFRAG Entertainment Group  although this never came to fruition. In November 2017, a spoof of Bob Ross and his TV show, The Joy of Painting, was used as the basis of a teaser trailer for the movie Deadpool 2. The same month, a Chia Pet model in Bob Ross's likeness was also released. ↑ "Bob Ross Was an Internet Celebrity Before the Internet". Retrieved September 15, 2016. ↑ Editors, Biography.com (August 4, 2016). "Bob Ross Biography". The Biography.com website. Retrieved September 15, 2016. 1 2 "Bob Ross, Television's Favorite Artist". Bob Ross Incorporated. Archived from the original on July 29, 2012. Retrieved January 24, 2011. 1 2 3 4 5 6 7 8 Congdon, Kristin G.; Blandy, Doug; Coeyman, Danny (April 21, 2014). Happy Clouds, Happy Trees: The Bob Ross Phenomenon. Univ. Press of Mississippi. ISBN 9781626740990. ↑ Schenck, Sally (director) (April 19, 2008). "Home Before Nightfall". The Joy of Painting. Season 28. Episode 13. 2:48 minutes in. PBS. 1 2 3 4 Congdon, Kristin; Blandy, Doug; Coeyman, Danny (2014). Happy Clouds, Happy Trees: The Bob Ross Phenomenon. University Press of Mississippi. ISBN 1617039950. 1 2 "Before they were famous, Airman edition". U.S. Air Force Live. 1 2 3 4 5 6 Linda, Shrieves (July 7, 1990). "Bob Ross uses his brush to spread paint and joy". Orlando Sentinel. Retrieved July 7, 2016. 1 2 3 4 5 6 "The Surprisingly Mysterious Life of Famed Artist Bob Ross". Today I Found Out. September 17, 2015. Retrieved December 30, 2017. 1 2 3 4 "Bob Ross 52, Dies; was a painter on TV". The New York Times. July 13, 1995. Retrieved October 2, 2011. 1 2 Kloc, Joe (October 1, 2014). "The Soothing Sounds of Bob Ross". Newsweek. ↑ Schor, Mira (1997). Wet: on painting, feminism, and art culture. Durham: Duke University Press. p. 176. ISBN 0-8223-1915-2. 1 2 Stanley, Alessandra (December 22, 1991). "Bob Ross, the Frugal Gourmet of Painting". The New York Times. Retrieved April 6, 2011. ↑ Thill, Scott (September 5, 2008). "Annuals + Bob Ross = Such Fun". Wired. Retrieved January 25, 2009. ↑ "What Happened to Bob Ross' Paintings?". July 16, 2012. Retrieved December 30, 2017. ↑ Stanley, A. (December 22, 1991). Bob Ross, the Frugal Gourmet of Painting. New York Times archive, retrieved December 24, 2015. ↑ Taubes, F. Mastery of Alla Prima Painting. F&W Pub. (1980), pp. 22-4. ISBN 0891340297. ↑ Gury, A. Alla Prima: A Contemporary Guide to Traditional Direct Painting. Watson-Guptill (2009), p. 16. ISBN 0823098346. ↑ Pegley, Kip (2008). Coming to wherever you are: MuchMusic, MTV, and youth identities. Middletown: Wesleyan University Press. p. 41. ISBN 0-8195-6870-8. 1 2 3 Brooks, Katherine (November 10, 2014). "Here Is Bob Ross Beating Paint Brushes For Over Three Minutes. You're Welcome". The Huffington Post. ↑ "Haven in the Valley". Beauty is Everywhere. Season 1. Episode 26. Event occurs at 18:30. Netflix. ↑ Season 15, Episode 12, Forest Lake. YouTube. The Joy of Painting. ↑ Bennett, Kaylen (2005). Rick Benzel, ed. Inspiring Creativity: An Anthology of Powerful Insights And Practical Ideas to Guide You to Successful Creating. Playa del Rey: Creativity Coaching Assoc. Press. p. 48. ISBN 0-9767371-0-8. ↑ Rife, Katie (April 16, 2014). "Study the happy little numbers with a statistical analysis of Bob Ross' Joy Of Painting". The A.V. Club..
↑ Patrick Wensink (March 30, 2015). "23 Happy Little Bob Ross Facts Most Viewers Never Knew". RealClear. Retrieved January 11, 2017. ↑ "Bob Ross, 52, Dies; Was Painter on TV". The New York Times. 1995. ↑ Linda, Shrieves (July 8, 1995). "Painter Bob Ross Dies At 52". Orlando Sentinel. ↑ Morfit, Cameron (November 18, 2001). "The Mellow, and Undying, Magic of Happy Little Trees". The New York Times. Retrieved January 20, 2011. ↑ Zinski, Dan. "Bob Ross Just Became A Video Game Character". Screen Ranted. Retrieved September 9, 2017. ↑ Haque, Ahsan (June 15, 2009). "Family Guy Flashback: "15 Minutes of Shame" Review". PC Review. Retrieved September 15, 2016. ↑ "Bob Ross: 13 Happy Little Facts About the Iconic PBS Painter". Biography. October 28, 2015. Retrieved November 1, 2015. ↑ ""Peep Show" The Interview (TV Episode 2003)". ↑ Albanesius, Chloe (October 29, 2012). "Bob Ross Paints 'Happy Little Trees' for Google Doodle". PC Magazine. Retrieved October 29, 2012. ↑ Driscoll, Molly, "Bob Ross: How did he get so mellow? (+video)", Christian Science Monitor, October 29, 2012. Retrieved October 29, 2012. ↑ "Lowe's TV Commercial, 'Masters'". iSpot.tv. ↑ Leopold, Todd (October 29, 2015). "Bob Ross Marathon Underway on Twitch TV". CNN.com. Retrieved October 30, 2015. ↑ Machkovech, Sam (October 29, 2015). "Twitch launches "Creative" category, eight-day Bob Ross Painting marathon". Arstechnica. Retrieved October 30, 2015. ↑ "Bob Ross channel on twitch.tv". The Joy of Painting Marathon - Celebrating the official launch of Twitch Creative! #painting #oilpaint #bobross. October 29, 2015. ↑ Porter, Matt (November 9, 2015). "5.6 Million People Watched Bob Ross's Twitch Marathon". IGN. Retrieved November 9, 2015. ↑ Hayley Cuccinello Entertainment Writer, The Huffington Post (June 2, 2016). "You Can Relax Now, Because Netflix Is Streaming Bob Ross". The Huffington Post. Retrieved June 16, 2016. ↑ Hughes, William. "Painting guru Bob Ross is on Netflix now, so there's your weekend". News. Retrieved February 2, 2018. ↑ "Bob Ross is coming to Smite as a happy little Sylvanus skin". pcgamer. Retrieved May 25, 2017. ↑ Minotti, Mike. "Bob Ross is now on Smite — yes, that Bob Ross". Venturebeat. Retrieved September 9, 2017. ↑ Surette, Tim. "Wii, DS, PC Bob Ross game dries up?". Gamespot. Retrieved September 9, 2017. ↑ Totilo, Stephan. "Video game based on bob ross' 'joy of painting' in the works". MTV. Retrieved September 9, 2017. ↑ Dawn, Randee. "Target is selling a Bob Ross board game and it looks delightful". Today. Retrieved October 6, 2017. ↑ Thuy Ong (November 17, 2017). "Watch Deadpool paint and shoot things in the new teaser trailer". The Verge. ↑ "There Is A Bob Ross Chia Pet And I Am Crying Happy Little Tears". BuzzFeed. Retrieved November 26, 2017. "PBS Video Mashup Honors 'Joy Of Painting' Host". Huffington Post. Associated Press. July 26, 2012. Retrieved October 29, 2012. July 26, 2012. "Bob Ross Remixed – Happy Little Clouds." on YouTube Public Broadcasting Service Digital Studios.